Homemade Greek Moussaka Recipe Truly Delicious! 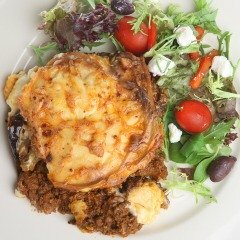 A Traditional greek moussaka recipe is made with layers of potato, aubergine, courgettes and spiced minced meat in the centre. Lamb or beef is normally used but you can substitute with pork or turkey. The topping is normally a white sauce and grated parmesan cheese. Other versions just use aubergine, which makes the mousaka a lighter meal. My family enjoy both. Just have fun experimenting to find which version you prefer. We love to have this traditional greek recipe with a side dish of freshly made garlic bread and a greek salad in summer. In winter I serve it with homemade garlic wedges made with Cyprus potatoes, the world’s best potatoes. Peel potatoes and boil in hot water until almost cooked through. Drain and leave to cool. Wash the courgettes and cut into 1/2 inch circles. Put a little olive oil in a pan and fry them until slightly brown. Remove from the pan and place on kitchen towel to soak up the oil. Wipe the pan and heat a little olive oil. Cut the aubergines into circular slices. About ½ inch thick.Fry the slices in batches, until soft and slightly brown. Place the aubergine slices on kitchen towel to soak up the oil. 3 In a large pot heat 2 tblsp of olive oil. Add chopped onion and crushed garlic. Cook until soft. Add allspice and cinnamon. Fry for another 2 minutes. Mix in the minced meat. Stir and fry until brown. Pop the red wine in, simmer for a few minutes. Add the chopped tomatoes and oregano. Turn up the heat until the ingredients reach boiling point. Lower the heat again to a gentle simmer. Add more seasoning at this point if you feel the need. When the mixture has thickened slightly, mix in 2 tblsp of parmesan and a tblsp of tomato paste. 1.Pour the milk into a saucepan. 2. Add the bayleaves and crushed black peppercorns. Simmer on a low heat until the milk starts to boil.Turn the heat off. Cover the saucepan and leave for 15 minutes to let the flavors develop. Pop the butter in another saucepan on low heat. Mix in the flour which will make a paste or roux. Mix for a few minutes. Using a sieve, strain the seasoned milk into a jug. Pour a little flavoured milk into the roux. Using a wooden spoon, continuously stir while gradually incorporating the milk. You want a smooth consistency all the time. You should end up with a lovely thick and smooth sauce. Stir on a low heat for a few more minutes. Now turn off the heat and mix in the 2 egg yolks and a little salt. Using a large casserole dish, I use pyrex. Put 1 layer of potaotes, auberbine and courgette. Now add the meat mixture, making sure to cover all the vegetables. Now layer the courgette, aubergine and potoates, in that order. Pour the white sauce evenly over the top layer of potaotes.Sprinkle grated parmesan over the white sauce. Cook in the oven until the top has turned a lovely golden brown about 1 hour. In Winter serve with, homemade Garlic Wedges and vegetables of your choice. Do you have a tasty greek moussaka or other Cypriot recipe you have made at home? Please don't be shy...share with other visitors.